Preparing for the unthinkable is what sets tactical professionals apart and saves lives. That is why Voodoo Tactical has come out with the 2-In-1 First Aid Pouch. This individual first aid bag has been engineered to offer immediate access to critical medical gear. An internal pouch quickly removes providing rapid reach to gauze, bandages and other essential first aid equipment. 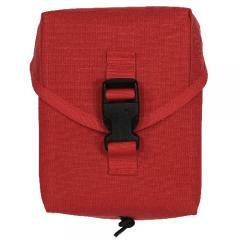 The sturdy elastic cord ensures reliable access to the pouch and keeps it tethered to the bag. Sewn-in, internal elastic loops and a series of hook-n-loop retention pockets offer secure storage and strategic access to contents. Built to withstand the extreme duress of tactical use, the military-grade nylon construction and heavy-duty buckle closure ensure maximum service life. The addition of a MOLLE-strapped backing provides secure attachment to any webbed platform.